Times seems to have doing quite well as compared to others when it comes to their Internet properties – They are now ranked as the largest Indian web property for Indian traffic. 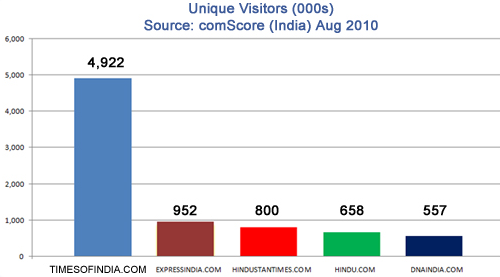 According to recent comscore data – Times Internet properties received 10.52 Million Unique visitors as compared to Rediff’s 10.48 Million for month of August 2010. Although the in all other metrics, Rediff is quite ahead of Times – For e.g: Rediff get about 1.46 Million visitors daily as compared to less than a million of Times and visitor time spent of Rediff is more than thrice that of Times. At the top, the Gap between Google and Yahoo seems to be widening, with Google sites commanding over 95 percent reach in India as compared to Yahoo’s 73.5 percent. Microsoft who till now had always been 3rd behind Google and Yahoo has moved to 4th. Facebook’s tremendous growth has ensure that they are at 3rd with 56 percent reach in India. Amongst English Newspapers Portals in India Times of India ranks much ahead of its rivals with close to 5 million uniques, while Indian Express ranks second with less than a million uniques for month of August 2010. I am not sure, but Rediff seems to have stagnated, while the competition seems to have caught up with them. dunno why but i still prefer Rediff over TOI. It loads faster, the news breaks faster on Rediff than any other portal. But ya, Rediff needs to do something about the morons who comment there and their abusive language. Good article. @Aaltaf, what you say about rediff seems to be correct but TOI is no good either..it has reduced to a tabloid and is heavily promoting sleazy picture galleries and pop culture articles. Any comments ? Rediff though may be bigger site than others but they do not have stuff. They use controvercial titles for articles, encourage two bit nobodies to place comments on any topic. This encourages worthless people who got all time in the world to keep argueing live on any topic and feeling they have contributed to the genral flow of information. I can safely say 99% of the visitors to rediff are there just for time pass. They have no intention of learning knowledge. They come there to argue. When I read above that rediff is stagnating I feel happy that the worthless people have all moved to rediff and there are no more there to join the band. Except for their Money section, its useless site. I regularly go through financial sites but I have to admit I never am comfortable with the times format of news. So I stick to No. 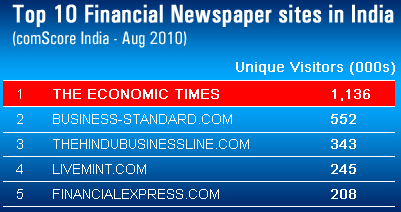 2 and 3 in the above list Business-standard and Thehindubusinessline sites daily and continuously. I even recommend these sites to those guys who newly aquired the taste for stock markets. Completely agree – I think Rediff has lost its way in last couple of years – and my biggest complain, like you pointed out, is that they have not been able to attract serious crowd – as the news they publish is downright bad. That is the testament of Rediff’s failure..
Times is a big brand in India now. It’s clear from the chart that others are nowhere this. I like rediff also for user interation.